A Cajun Classic! The general consensus is to soak beans 8 to 10 hours before cooking noting however you cook beans without pre-soaking.Also sauteing veggies can be done and will enhance flavor. If you have a large crock pot. Put all ingredients except the rice into the crockpot and cook on high for 8 hours. Serve over cooked rice. Stove Top: Large heavy bottom pot. Bring to boil for 45 minute occasionally stir through. Bring down to simmer for 4 ½ hours covered. Stir about every 30 minutes. Last hour: in a separate pot, put 3 cups rice to cook. salt to taste. When beans are done. Mash about 1/3 of mixture and blend in with remainder of beans. Water maybe added to make a saucy gravy. Serve over cooked rice. 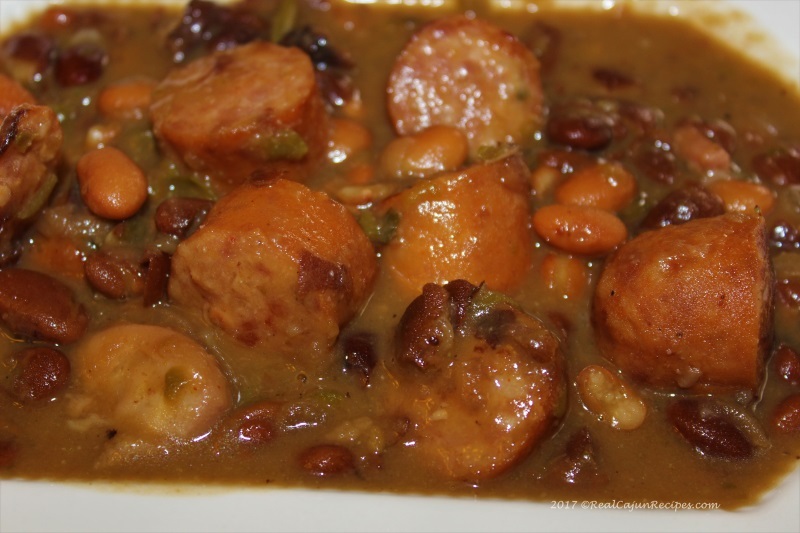 Method 2 another popular cooking version from a visitor - With both sides of my family's history rooted in New Orleans, I've come to love red beans and rice. My grandma made it, eventually passed that on to my father vice versa on my mothers side. These were (and still are) a weekly staple in our weekly menu. There are a few things I'd do differently here. 1.) Soak the red beans overnight. You can use the water you soak the beans in as a broth the next day and add more flavor to the beans (chicken/beef stock works too). 2.) Use fresh celery, garlic, and onion. Sautee the ingredients in olive oil on the stove and cook until tender and fragrant. I use lots of garlic as it makes the beans burst with flavor. I love the smell as they slow cook. 3.) Add turkey sausage/beef sausage etc in the slow cooker during the last hour. You don't want to overcook the meat to remove it's flavor.